Published: Dec. 22, 2018 at 11:24 p.m. Published: Dec. 16, 2018 at 03:27 p.m. Published: Nov. 18, 2018 at 04:22 p.m. 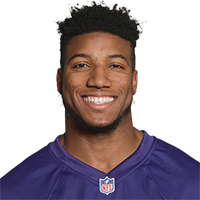 Published: Dec. 3, 2017 at 03:58 p.m.
Baltimore Ravens cornerback Marlon Humphrey picks off Detroit Lions quarterback Matthew Stafford's pass.